The 2016 Club Events have been announced. Emma is organising a trip to the Tryweryn on Sunday 21st June. If you fancy going, drop her a mail, text or msg her on Facebook to let her know you are interested. ​Same plan as usual, meet at the Tees Barrage White Water course on Wednesday at 4pm. If you can let me know if you are coming, either by email – emmaparkin06@gmail.com or text me – 07515854290 so we can keep an eye out for you. Starting from Richmond falls to Catterick Bridge. It is a paddle for beginners at a level of 1 meter and below. 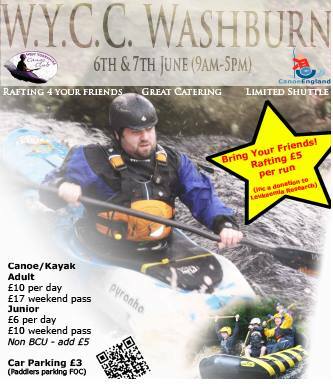 If you’ve attended Mike’s white water sessions or other beginners trips then you should be fine. There is a charge at the car park at Richmond falls so the idea is to leave as few vehicles there as possible obviously. For directions to the get out at Catterick Bridge House Hotel, use DL10 7PE. Remember Mike’s Calder trip is this coming weekend too (8th Feb). I’m planning a trip on the River Rothay, in the Lake District, on 25th Jan which will be suitable for beginners. The views are very picturesque and interestingly, we put on just up from the church where Wordsworth grave is located. Please email me at club.secretary@westyorkshirecanoeclub.com if you would like to come and I’ll circulate plans closer to the date. Hopefully the weather will hold up and the levels will be suitable.